Achromatopsia or Color Vision Deficiency - CVD is a relatively rare condition that manifests in many ways. The inability to differentiate red from green is probably the common form of color blindness that affects more men than women - 7 % of US male population as against just 0.4 % of female. But blue/yellow color vision problem, though rare, has no gender bias. Total color blindness or Achromatopsia is comparatively rare. Color Perception: Every human retina has about 6 million cone cells of three types sensitive to the primary colors - Red, Green and Blue. The photo pigment each cone contains is specific to one particular light wavelength. A 'normal' color vision implies that all cone receptors have equal response to the narrow band spectrum of color human eyes can perceive. Human retina also has 120 million Rod cells which can perceive fine details and gradations largely responsible for visual acuity. Thus it can be seen that a human eye is 'designed' to visualize more monochromatic details than details in color. Some drugs such as antibiotics, antihypertensive, barbiturates and drugs to treat psychological and CNS conditions can affect the color vision. Industrial chemicals like CO, fertilizers, solvents and lead can hurt the color vision on prolonged exposure. Diagnosis: There are many visual tests available to diagnose color perception deficiency - American Optical Pseudoisochromatic test plates, Titmus vision tester and Ishihara test to name a few. 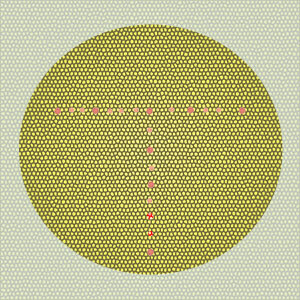 These tests contain color coded patterns or numbers against another set of colored background. Treatment: There is no treatment for inherited color blindness. In the case of acquired color deficiency problems, removal of the causative condition may help to regain normal color perception over a period of time. But usually there is poor prognosis for most color blindness conditions. Most patients generally adapt to their abnormality by looking for other subtle cues.